Sharron Angle (R-NV) is running for the U.S. Senate with a far-right agenda that can be adequately summed up as "drown the government in the bathtub." 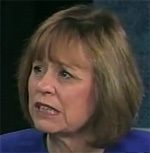 Angle's views on health care are no exception, as she supports repealing the Affordable Care Act and opposes the regulation of insurance companies. Recently, Angle has come under fire for mocking the idea that insurers should be required to cover treatment for autism. Angle's campaign acknowledged to Nevada journalist Jon Ralston Monday that both the candidate and her husband receive health care from the federal government. Spokeswoman Ciara Matthews said in a statement: "Mr. Ted Angle receives his pension through the (federal) Civil Service Retirement System. While it is not supplemented by the federal government, current civil servants pay into the program to pay the schedule of those already retired - much like how the Social Security Program works today. Mr. Angle does not qualify - nor does he receive Social Security benefits. His health insurance plan (the Federal Employee Health Program), which also covers Sharron, is a continuation of what he was receiving while he worked for the federal government." Angle isn't the only right-wing Republican to bash government involvement in health care while benefiting from it. Back in May, the Minnesota Independent reported that Rep. Michele Bachmann (R-MN), a frequent critic of "socialized medicine," was profiting from a government-run health program in Minnesota through her husband's Christian mental health clinic.